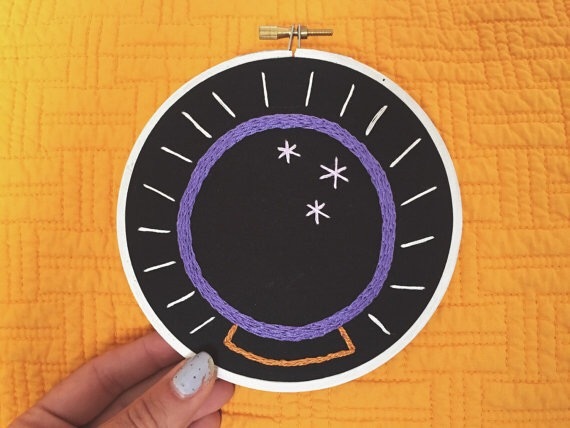 One of my favorite emoji’s is the crystal ball. 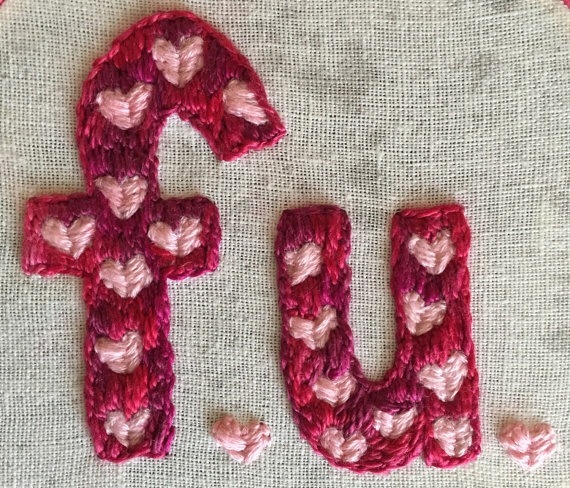 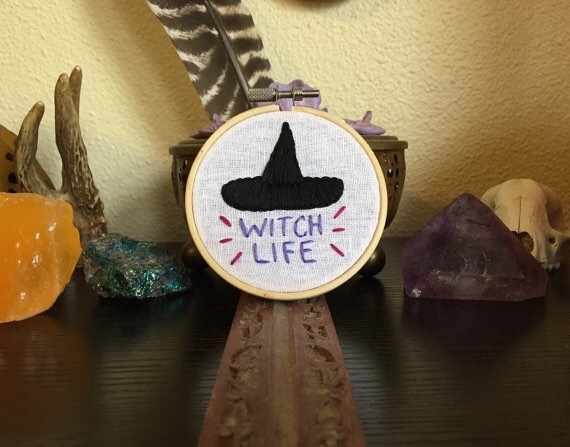 Naturally I decided to do an embroidery of it! 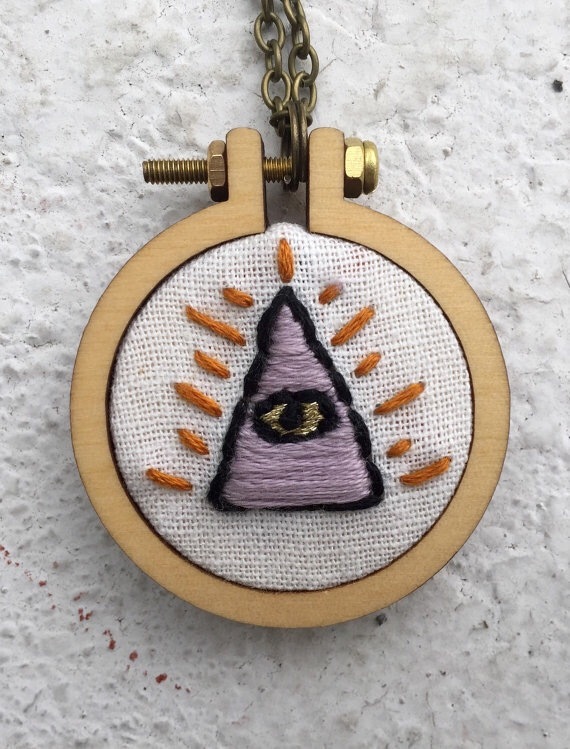 It is done in a 6″ wooden embroidery hoop painted white. 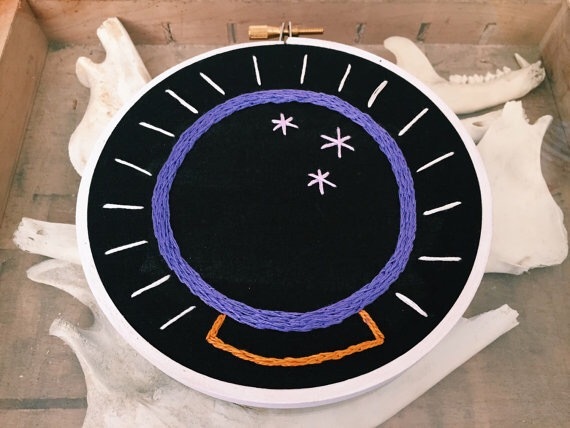 It is on black cotton using two different purples, gold, and silver embroidery floss. 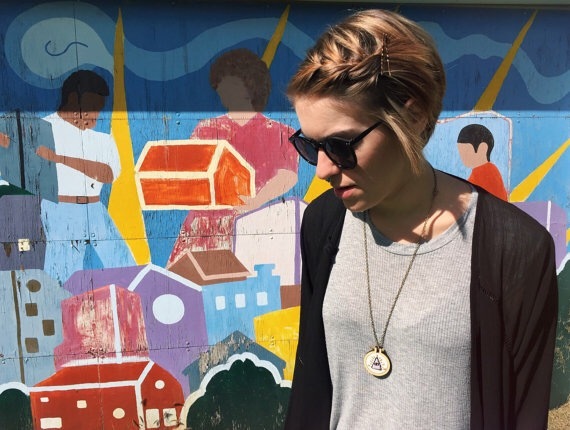 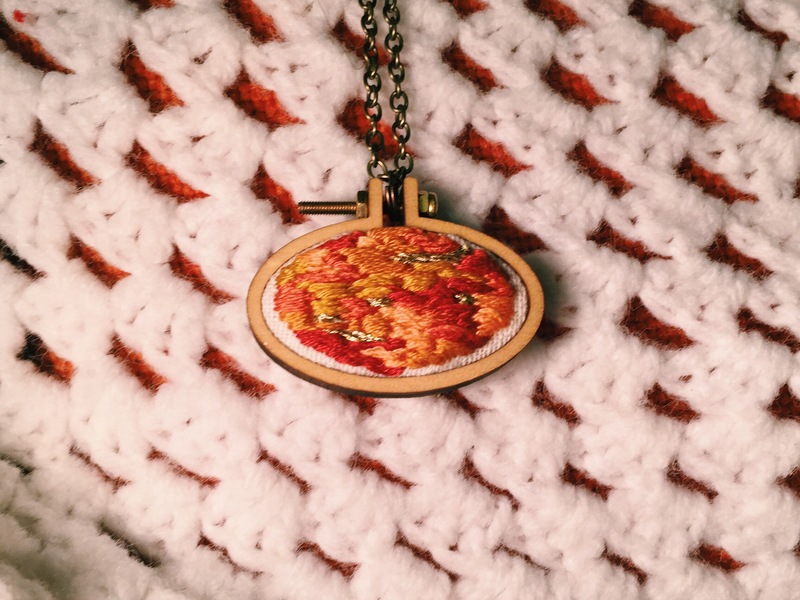 I liked this one so much I also made a necklace out of it! 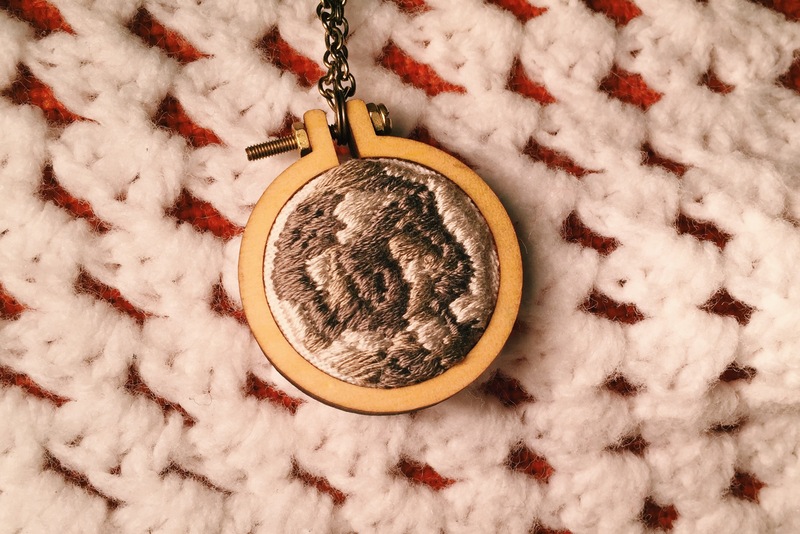 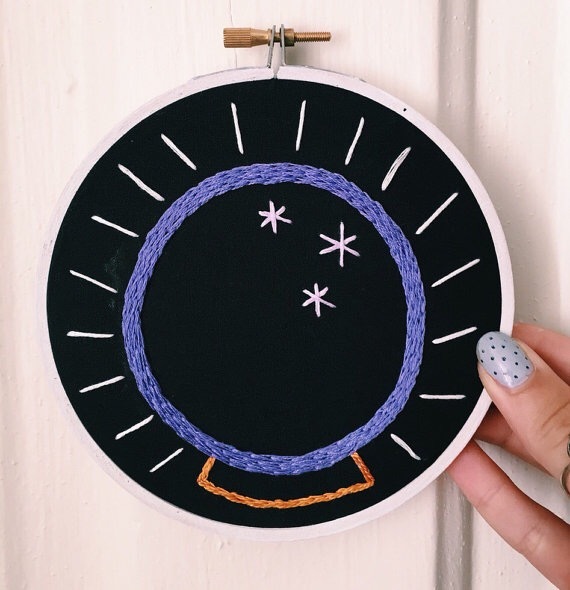 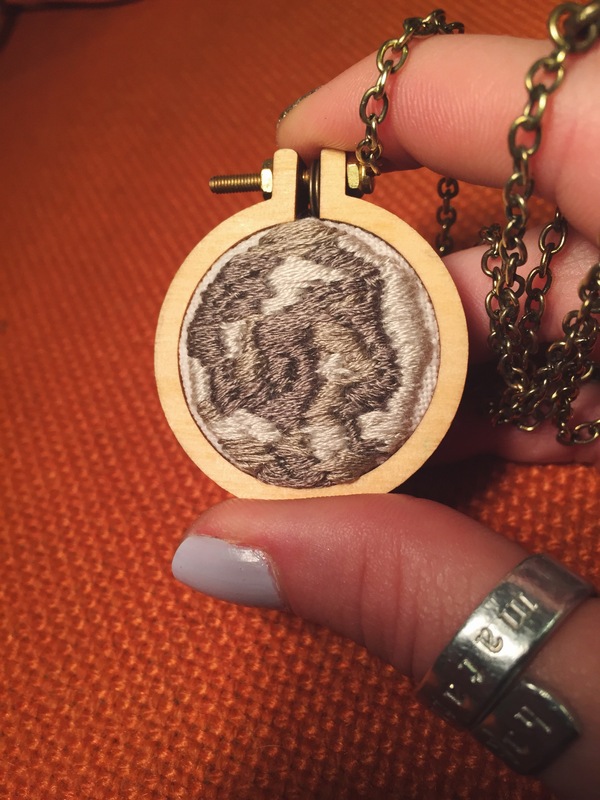 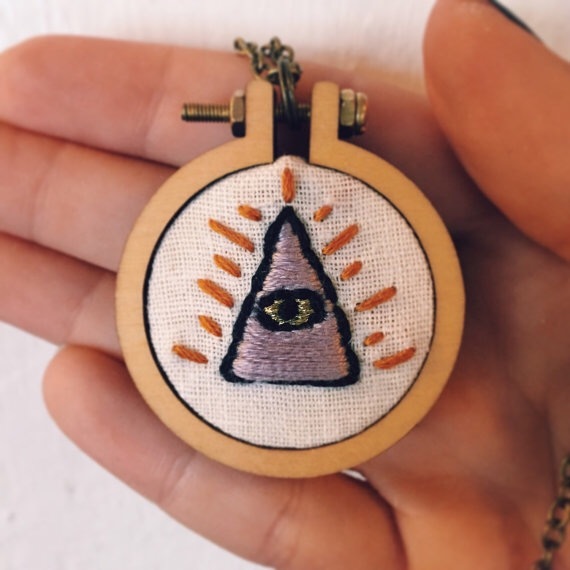 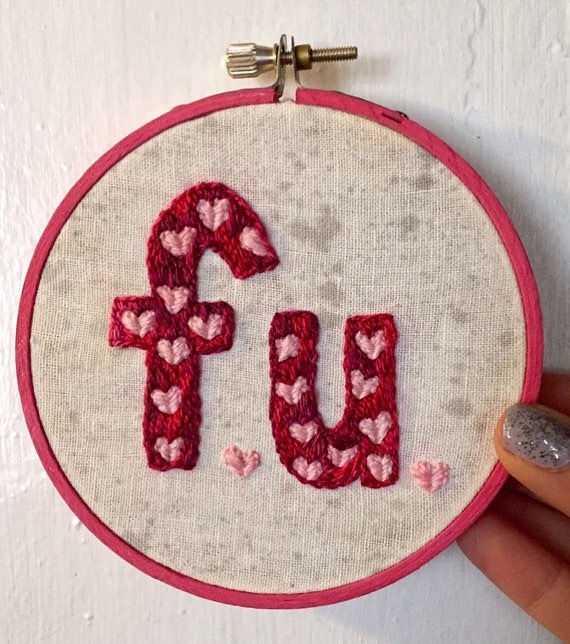 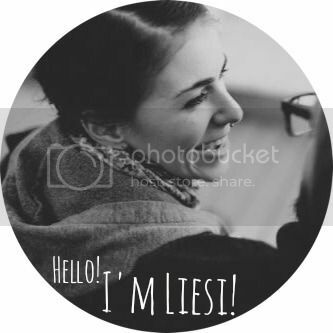 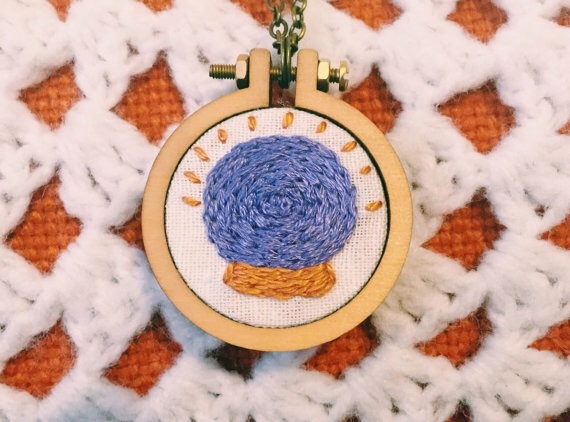 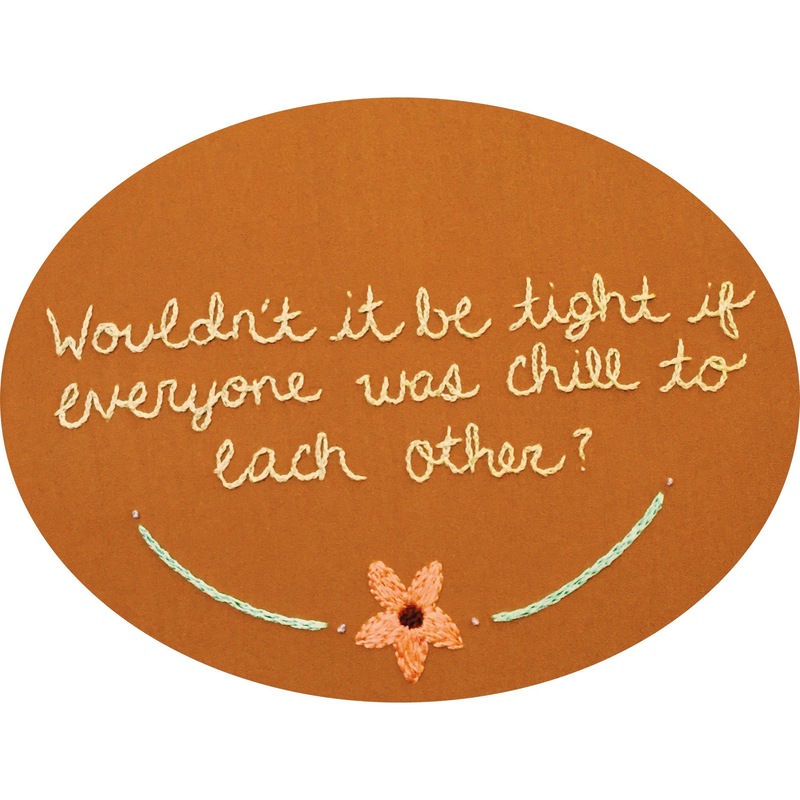 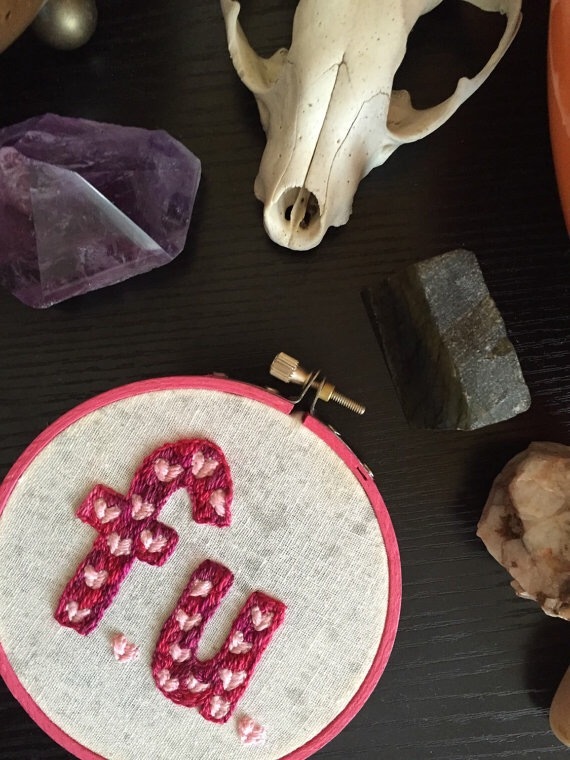 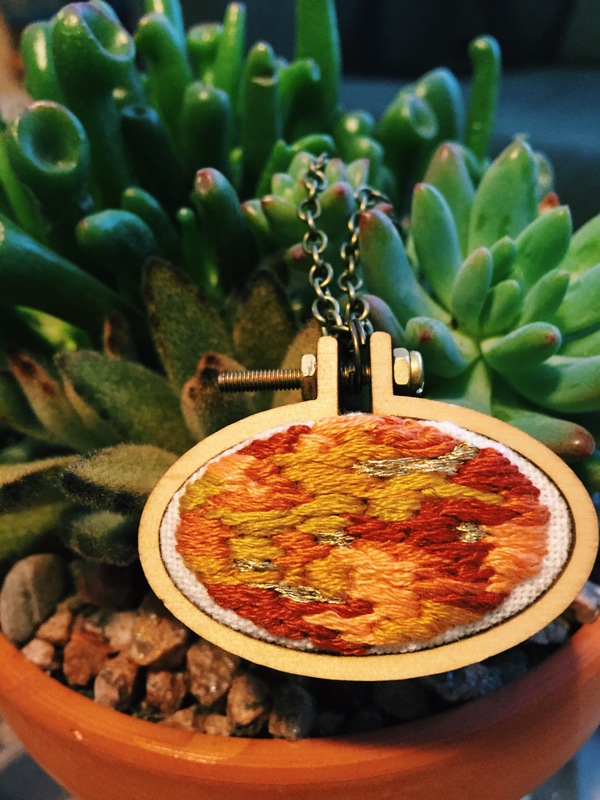 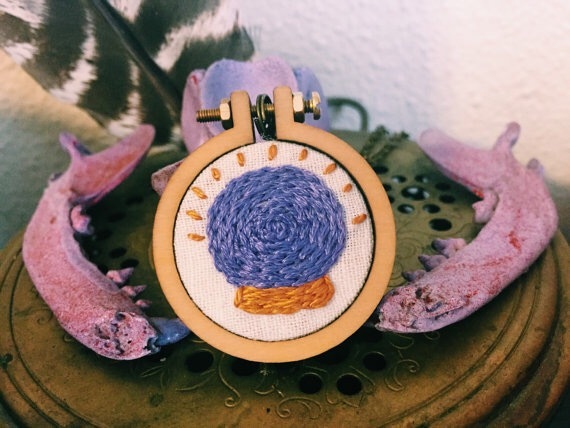 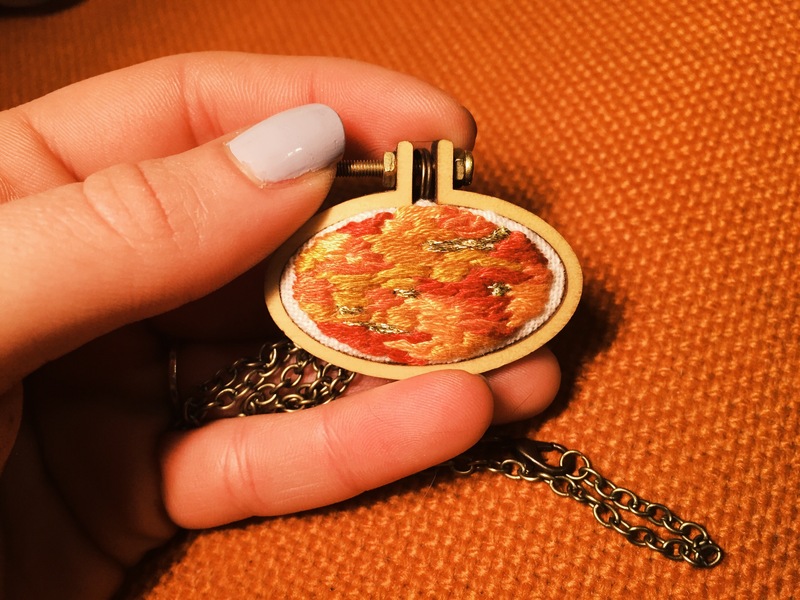 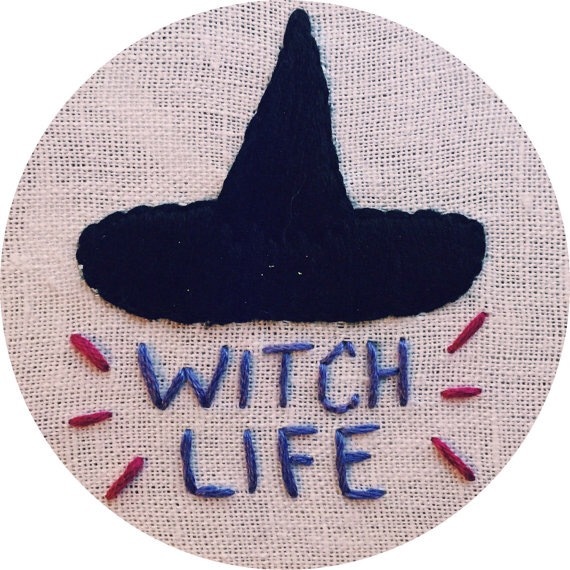 It is done in a 1.5″ wooden embroidery hoop. 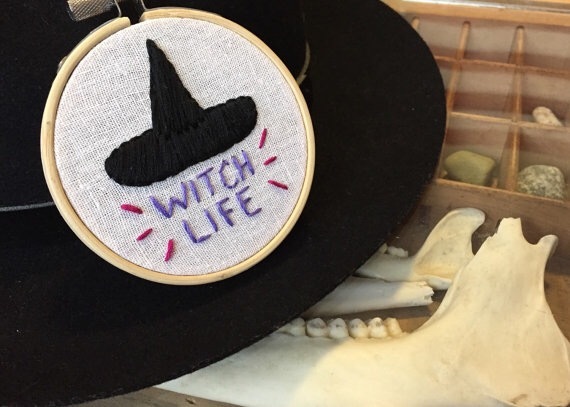 Both of these are available in the shop for sale. 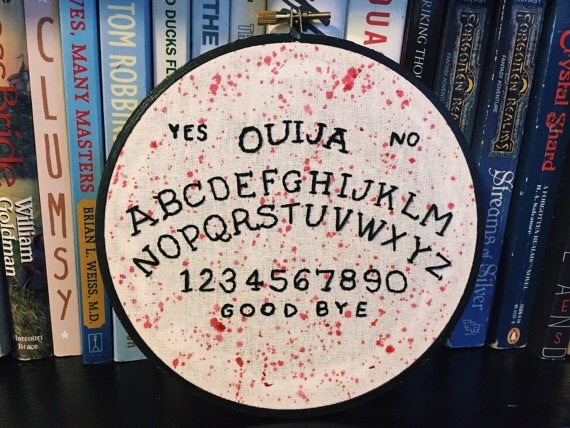 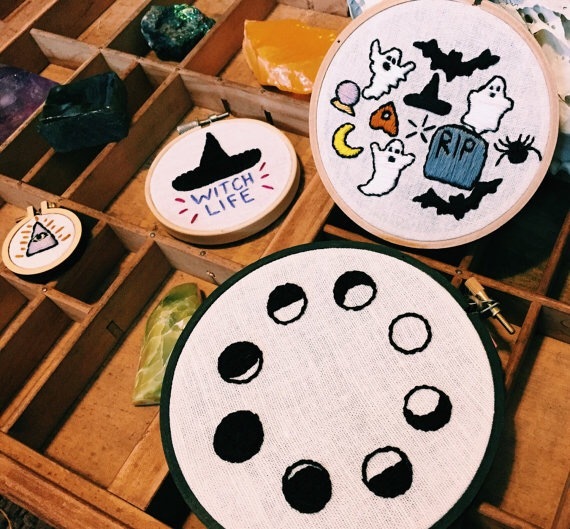 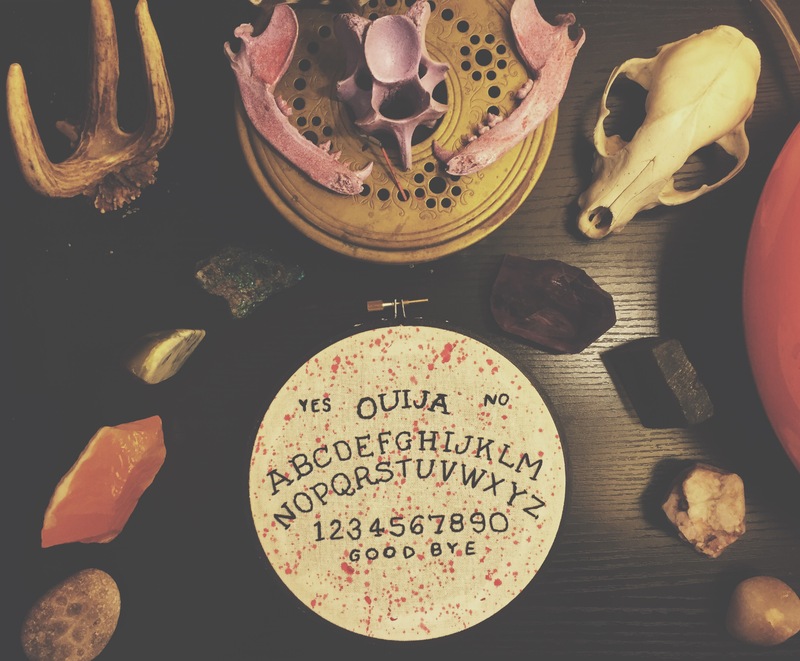 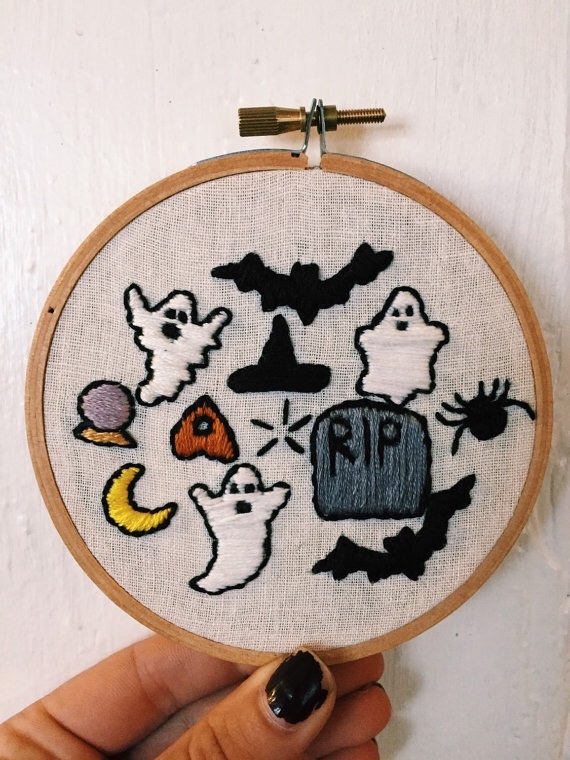 Last year I did an embroidery of a Ouija board, and this year I did a second one, but with a little bit more of a Halloween feel to it. 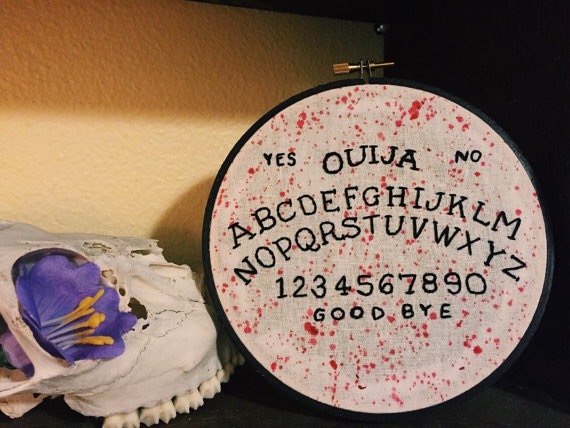 I did this embroidery on white linen, and splattered it with red paint. 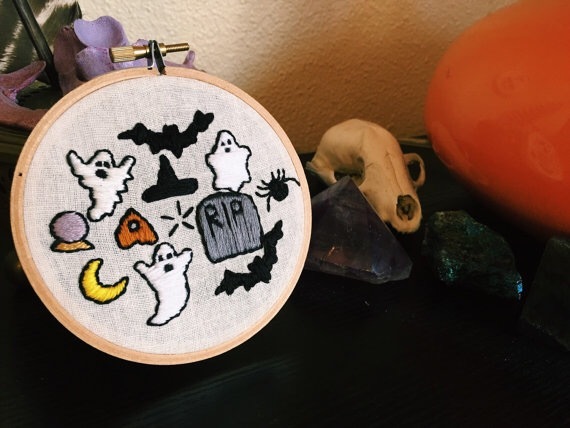 The hoop is wooden, but I hand painted it black. 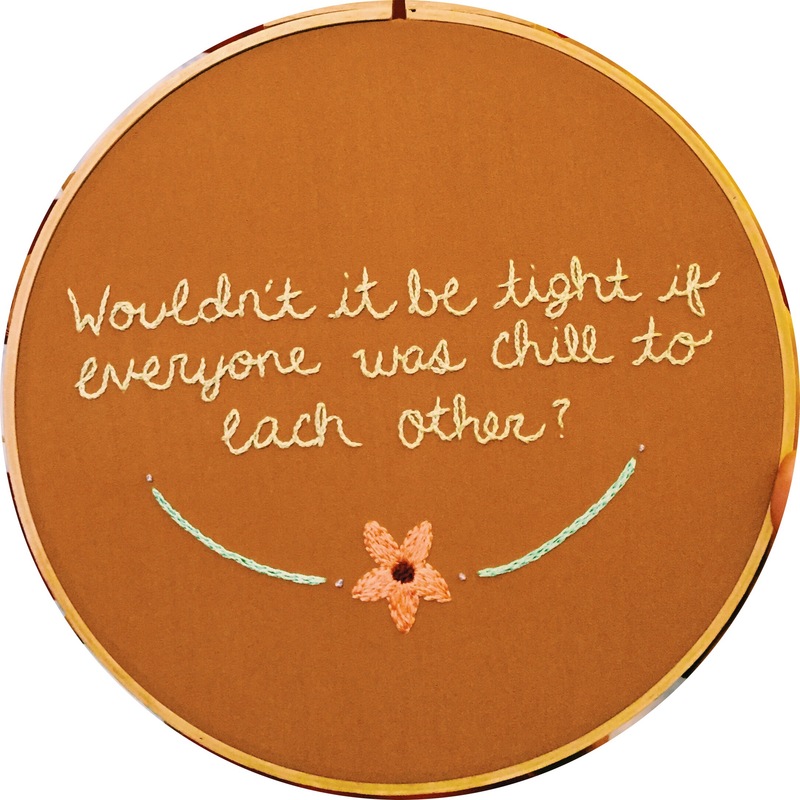 This embroidery has sold, but you can expect to see more like it. 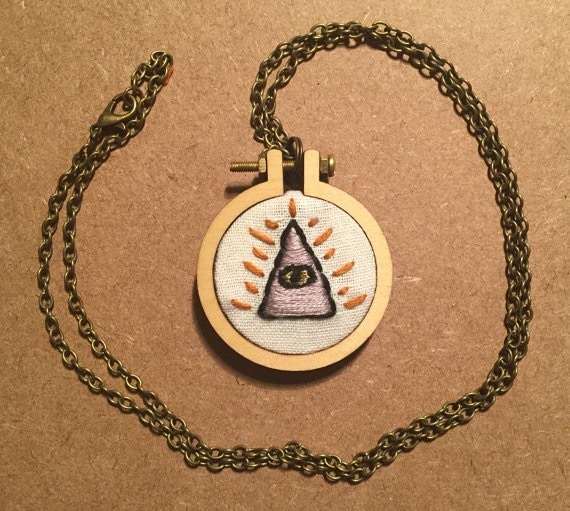 About a month or so ago I finished this commission. 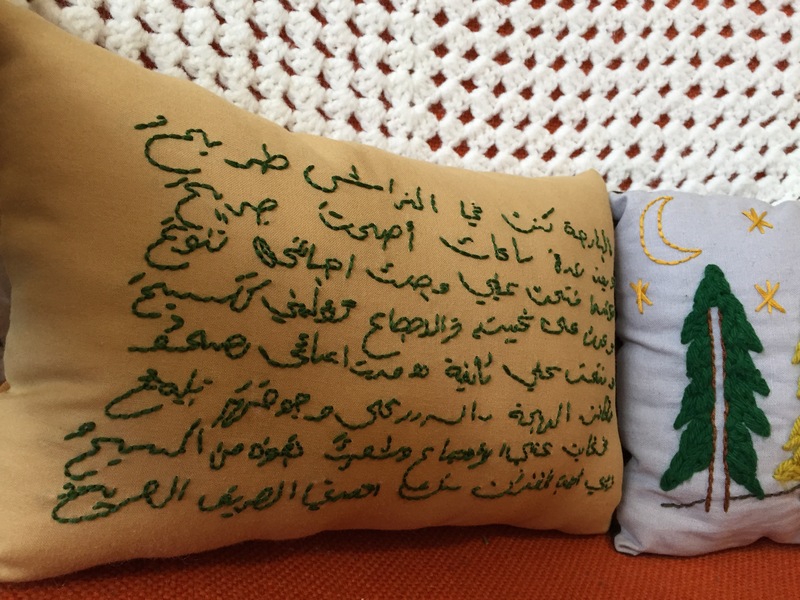 The customer ordered this for his boyfriend, it was a letter that his grandfather had written in Arabic. 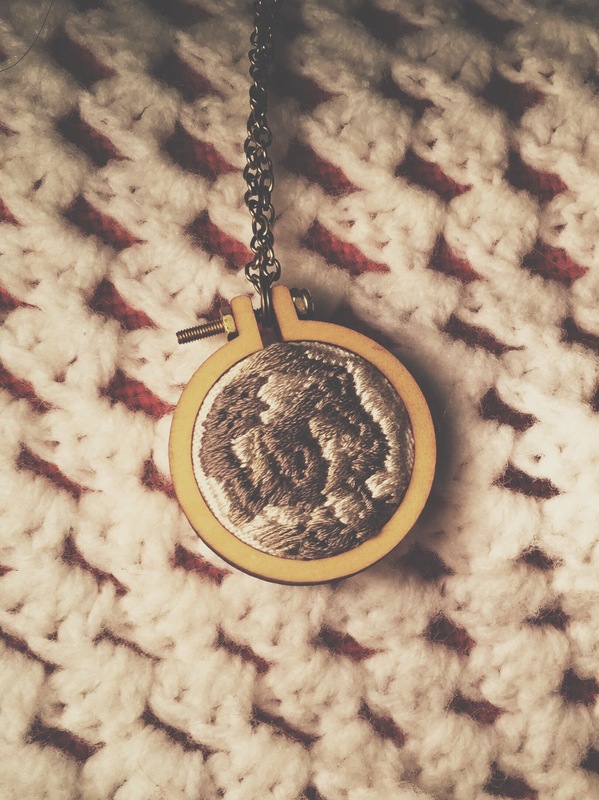 It was such a sentimental and sweet gift. 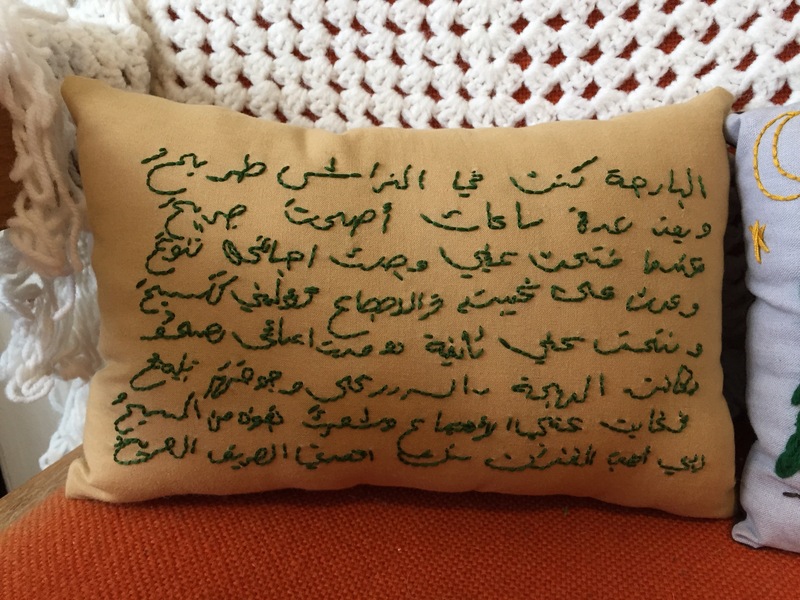 The back side of the pillow is also tan, however it is a darker color than the front. 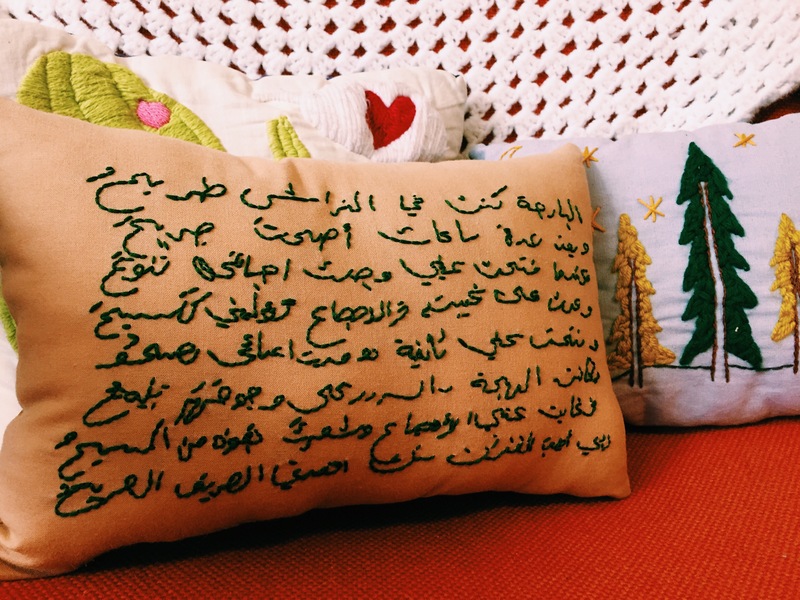 This pillow was a little difficult to work on, because when I transferred over the grandfathers handwriting it did not transfer very dark, so it was a pretty hard to see unless it was the brightest time of the day. 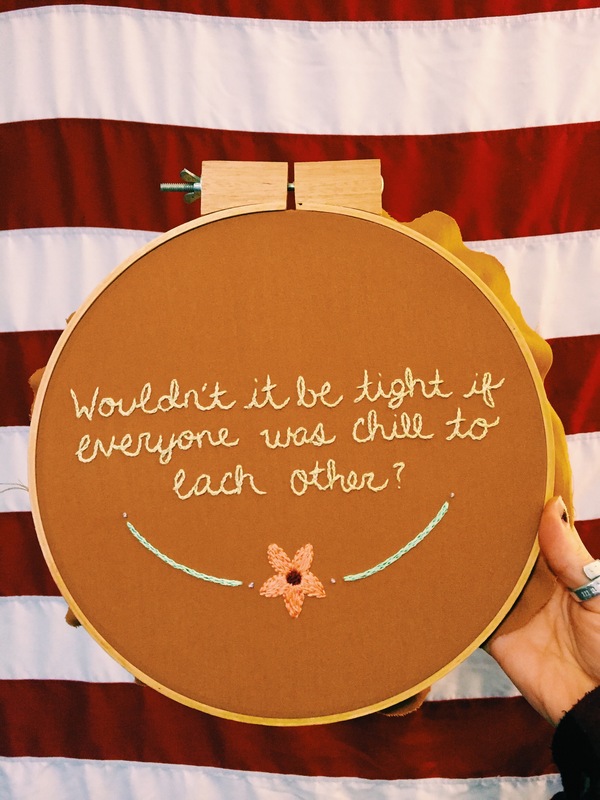 It was worth it, though! 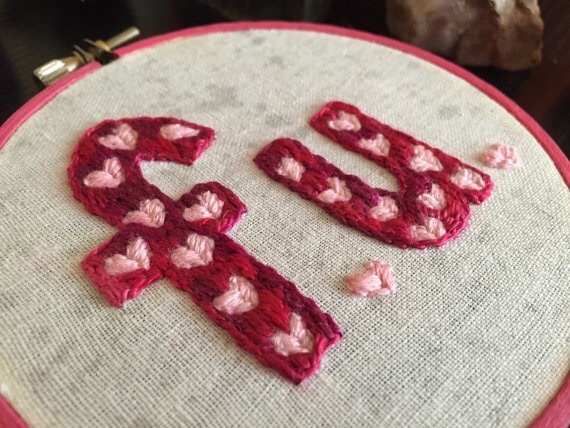 If you’re interested in your own commission piece, pillows start out at $50.00!